A truck that stands the test of time starts with a reliable frame. The same is true in fifth wheel towing. The key to safe, successful towing is a solid foundation. At CURT, we offer two types of custom 5th wheel brackets to ensure you have the solution you need for your particular truck. Engineered for specific makes and models, CURT custom fifth wheel brackets provide a solid mounting platform for your fifth wheel hitch. These brackets are shaped to contour to the frame of your truck and install using pre-drilled holes. This custom-fit design actually cuts installation time by up to 50%, and completely eliminates the need for drilling on most trucks. Once installed, custom fifth wheel brackets provide bolt holes for attaching a set of CURT industry-standard fifth wheel base rails. These rails mount above the truck bed and can accept any CURT fifth wheel hitch. CURT custom brackets are finished in a rust-resistant liquid Bonderite® coating and include all necessary hardware for a complete installation. CURT semi-custom fifth wheel brackets are an alternative custom bracket option. 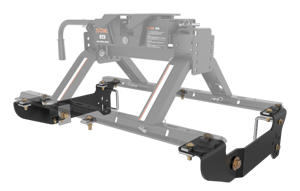 They are designed for vehicle-specific application but must be installed alongside CURT universal fifth wheel brackets. Each semi-custom bracket kit functions as a supplemental component to the universal kit. Like our custom fifth wheel brackets, semi-custom brackets come with a Bonderite® coating for a rust-resistant finish.